You are currently browsing the archive for the La Cruz category. From my condo it’s about a 45 minute walk along the beach to La Cruz de Huanacaxtle. For years, La Cruz was little more than a place for the local fishermen to haul out their pangas. But then a couple of years ago the Mexican government built a big first-class marina here. It hasn’t really caught on yet. Most of the dock space is still empty. Yachties I know who have docked here say it’s not really worth it. You pay the same as you would for a slip space in the Puerto Vallarta marina but there are fewer services nearby. Still, several 4-star resorts have recently opened just up the coast (including the St. Regis) and maybe in 20 or 30 years it will become the Mexican Cannes. There are, however, a couple of interesting places to eat. One is called Tacos on the Street because…well, they put tables and chairs out on the street and that’s where you eat. It’s a family run place, owned by Jorge and his wife Raquel. Jorge cooks up the rib eye steaks that are chopped up for the tacos and Raquel is in charge of making the fresh corn tortillas and salsa. This is their home and the restaurant side of the business is only open three nights a week—Wednesdays, Fridays, and Saturdays. They don’t have a liquor license but they don’t mind at all if you buy a beer or two at the market on the corner. Or even bring your own wine if you want. The rib-eye tacos are amazing. The last time I ate there, I had six of them. And only stopped ordering because I thought I was making a pig of myself. Then there’s Ana Bananas which you could say faces the marina if there was a view of the water, which there isn’t. There used to be. But when they built the marina they dumped earth in front of the outdoor patio and now it’s just a four-foot berm obliterating the view. Ana says they promised they would come back one day and remove the mound of earth and rocks but she isn’t holding her breath. So, instead, she had some shade cloth painted with a scene of what the beach looked like before the marina was built. And this shade hangs on some PVC poles on the patio in front of the berm. So you can, you know, sort of imagine what the view would be like without the hideous mound of earth. I’m not going to say the food is great at Ana Bananas because it’s not. It’s basically the sort of crap that yachties always seem to want—cheeseburgers, club sandwiches, nachos. But nobody comes here for the food (or the view). 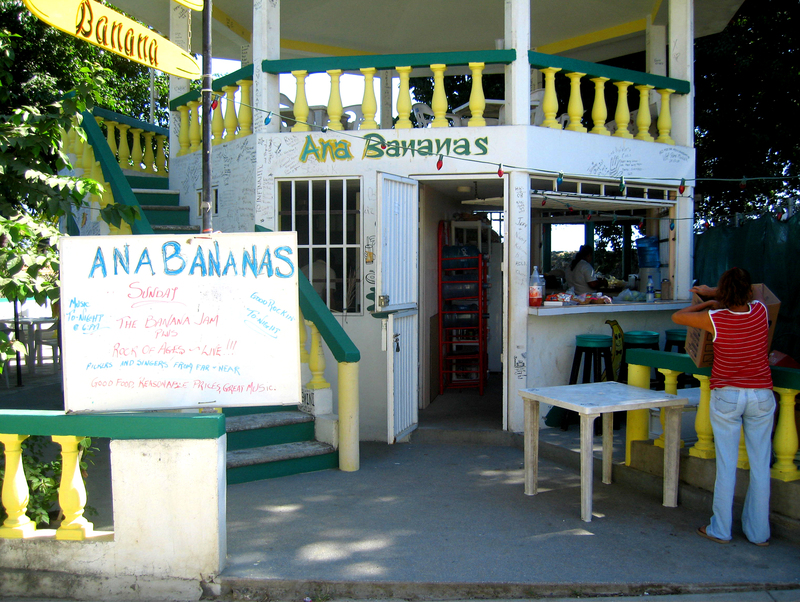 They come here on weekend evenings for the cheap beers and live music—the Banana Jam, as it’s called. You never know who is going to be playing. As the white board in front of Ana’s says, the Rock of Ages band is made up of “friends and singers from far and near.” Which means whoever happens to be in the area and feels like jamming. Sometimes the music is awful. Sometimes it’s extraordinary. But it’s always interesting. 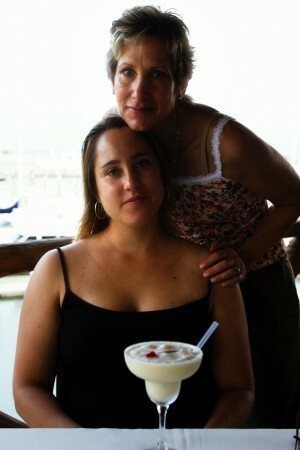 Yesterday The Girls were getting restless so I suggested we go have a sunset cocktail at the marina at La Cruz de Huanacaxtle. That place really mystifies me. It’s gorgeous. But there’s never anyone there. There must be at least a 100 berths here, yet except for a few Ha-Ha boats, the docks are empty. 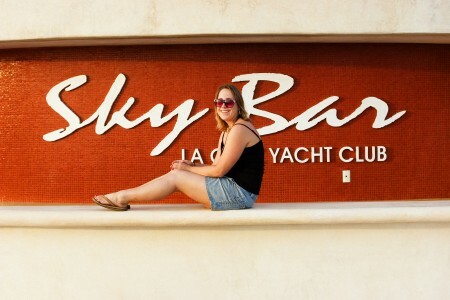 The idea was that all these glamorous yachties were going to come in with their big powerboats and stuff and so they opened up first-class restaurant and bar in a palapa-covered round building at the end of the marina but business is so slow that the outdoor Sky Bar, with its over-sized couches and chairs is basically shuttered for lack of customers (it does, however, make for a nice setting for a photo shoot). The restaurant downstairs is almost as sad. Here we were, half an hour before sunset, in this gorgeous setting, and there were only four other customers in the place. When I went up to the bar to place our order I talked with the marina manager, Christian Mancebo, who is a very nice guy. He admitted business was slow and blamed it on the $10 dinghy docking fee recently imposed on the marina. This is to prevent yachties from anchoring just outside the marina (and, thus, not paying for docking fees) and then bringing their dinghy in to take advantage of services like the showers, laundry, etc. The trouble is that these anchor-out boats had to pay $10 every time they brought their dinghy in. Which might add up to $40 or $50 a day. So a lot of them said Screw it, and moved on to Paradise Marina or Vallarta Marina. 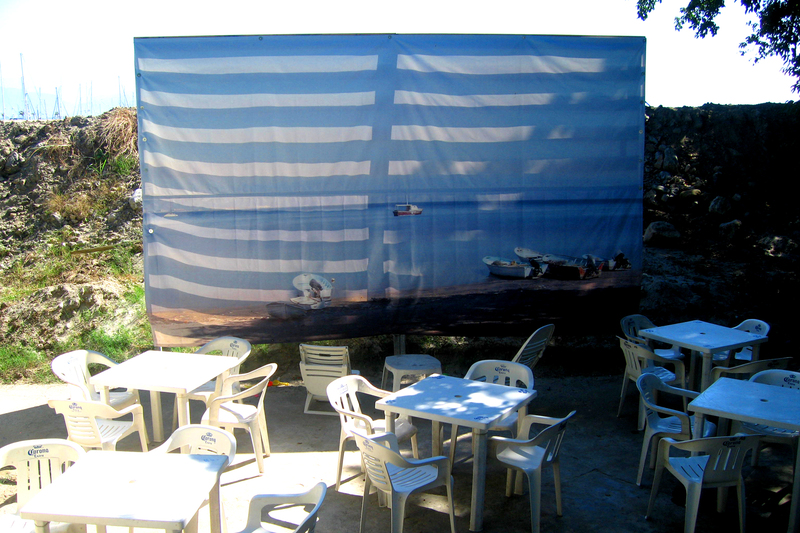 And thus, the La Cruz marina—and its lovely restaurant—sits empty. I think the marina owners need to think about an economic stimulus package (such as lowering dinghy fees to a few bucks a day). Unless they don’t mind losing a boatload of money. I wish Señor Mancebo well. But I wouldn’t want his job.